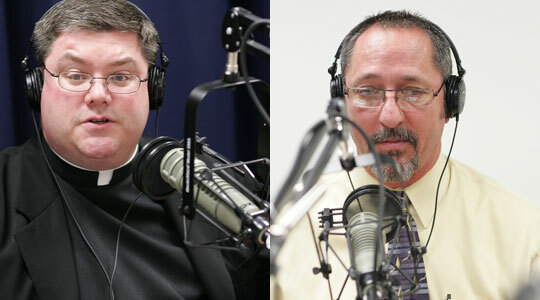 A summary of today’s show: Deacon Jim Greer talks to Scot and Fr. Chris about healthcare ministry and prison ministry within the Archdiocese and their vital roles in fulfilling the corporal works of mercy. Both professional chaplains and volunteers are needed for these important ministries. Also, an announcement today about Cardinal Seán’s appointment of a new vicar general for the Archdiocese. 1st segment: Scot welcomes all to the show and wishes everyone a happy Flag Day. He welcomes back Fr. Chris. Cardinal Seán made an announcement today that Msgr. Robert Deeley will become vicar general and moderator of the curia for the Archdiocese in September. He has been assigned to the Congregation for the Doctrine of the Faith since 2004. He served directly under Cardinal Ratzinger, who became Pope Benedict XVI. He’s been a pastor in Boston and was previously judicial vicar for the Archdiocese and president of the Canon Law Society of America. Fr. Richard Erickson has served as vicar general for five years. He received a three-minute standing ovation from the staff today. Prior to this post, he was an Air Force chaplain. Cardinal Seán had asked him to return home to this challenging job. Today’s guest, Deacon Jim Greer, says he has not worked closely with Fr. Rich but that they are close because of their shared military background. Fr. Chris said the Archbishop is the Chief Executive Officer and the vicar general is the Chief Operating Officer, who is responsible for how the CEO’s vision is implemented. Or from the political viewpoint, he would be the vice president. In any case, he’s involved with the nitty-gritty day-to-day running of the archdiocese. He ensures the Cardinal’s pastoral plan is implemented. Msgr. Deeley is both vicar general—which means he has the authority to work on behalf of the Cardinal in his name—and he’s the moderator of the curia—which means that he coordinates all the departments of the archdiocese’s various ministries. Fr. Rich will be going on sabbatical for three months in Rome at the Institute for Continuing Theological Studies at the Pontifical North American College followed by a new assignment in Boston. 2nd segment: Scot again welcomes Deacon Jim to the show. He asked about how he came to be a permanent deacon. Jim grew up in an Irish-Catholic family with a priest uncle. After high school, he went to the Coast Guard where he slipped away from the faith. After 10- years, he met his wife, who slowly brought him back to the Church. He remembers a mandatory meeting for his son’s First Communion, where the priest said if you don’t go to Church, how do you expect them to know the faith? That convicted him and he started going back to church. They moved to their present parish, where he became involved. He made a Cursillo weekend, which opened his eyes to serving God. He responded to a bulletin notice about looking into the permanent diaconate. He felt God calling him and his pastor told him to explore the movement of the Holy Spirit. He was ordained in 2006. Deacon Jim said his Cursillo was not like other people’s experience. He was on a confirmation retreat a month or two earlier where he had an experience of the Spirit, but didn’t understand it until he went on the Cursillo weekend and it became clear to him. He said he was scared to death of the diaconate coursework. He has an undergrad in health care administration, but didn’t feel like a good student. He said he wasn’t sure he was called to the diaconate right up until Cardinal Sean placed his hands on his head and called down the Holy Spirit on him in ordination. Fr. Chris asked him about the distinction between permanent diaconate and transitional diaconate. Transitional is first set of Holy Orders en route to the priesthood. Permanent deacons are usually married and are not going to become priests. They are able to provide some of the sacraments: baptism, assisting at the altar and preaching, and marriage. The unique aspect of the diaconate, Fr. Chris said, that if his wife were to die, he would remain unmarried after. Fr. Chris said permanent deacons provide a different perspective in the parish and that as we have fewer priests for the people to hear a different homilist at Mass. The restoration of the permanent diaconate is a fruit of the Second Vatican Council. We have several hundred permanent deacons in the archdiocese. Deacon Jim assists at Mass at the Bethany Chapel of the Pastoral Center on Tuesdays and Thursdays, with many different priests celebrating. Scot asked him what it’s like to sing as part of his ministry. Singing the Exsultet at Easter has given him a confidence in singing the chants at Mass. When you sing, you are praying twice. Scot said it should encourage others to hear how everyone can sing, no matter how their voice sounds. 3rd segment: Deacon Jim first came to work at the Pastoral Center as director of health care ministry. Prior to that he’d worked at Mass. General for about 11 years in administration. He’s been able to combine that with his ordained ministry. He said there are 33 chaplains who report directly to the archdiocese with 72 healthcare facilities. The Archdiocese staffs 25 and 25 hire their own. The rest have parish support. There are 4 or 5 priests, 1 deacon, 4 or 5 religious, and the rest are lay members who are board-certified through the National Association of Catholic Chaplains. Every healthcare institution is different, but most chaplains spend their time in prayer or in the presence of those who are sick and in end-of-life issues. They do a lot of ministry with family members, dealing with end-of-life. they do a lot of ministry with the staff, dealing with the trauma they see on the regular basis. Just their presence can bring a calming effect to everyone. Fr. Chris said one of the principal benefits of the priest is the sacrament of the sick. He encourages everyone listening that at any point in sickness is a good time to invite a priest for the sacrament, not to wait just until the end. Deacon Jim said a lot of older people still think of the sacrament as something just for those about to die. But we should take advantage of the healing presence of the Holy Spirit as soon as possible. The chaplains hired by the Archdiocese are in secular hospitals. The Catholic hospitals hire their own. In some hospitals, there are chaplains of multiple faiths and in others the chaplain ministers to all. Deacon Jim said his philosophy is to minister to all of God’s people. Scot asked about the formation program. They want to have board-certified chaplains, which means they have to have a Master’s degree in theology and four units of clinical pastoral education. One unit is 400 hours working in a facility in bedside ministry, narratives, and more to look at oneself in order to be present to others. They do their studies in many places: Master of Arts in Ministry, Boston College, Boston University, and others. To find out more information about becoming a professional chaplain, go to the National Association of Catholic Chaplains website. In addition to professional chaplaincy, Deacon Jim thinks parishes should have a ministry to the homebound, to nursing homes, and to assist chaplains in hospitals. They do workshops for parishes around the archdiocese to train people to bring the Eucharist to the homebound. Fr. Chris said seminarians work in several of the hospitals where they encounter people of many faiths and none at all and they get into beautiful conversations as people wrestle with questions of life and death. 4th segment: He added the coordination of the prison ministry in the archdiocese to his job coordinating health care ministry. During his diaconal formation, he did a summer internship. He begged not to be put into prison ministry because he was scared. He preferred hospitals, especially since he already worked there. When the director of prison ministry, he was asked to look into the needs of the ministry. The first time he went into prison, he was assisting at Mass and the inmates singing sounded like angels singing. It was a beautiful Mass. Then he talked to them and learned that they were not different from him and brought a new appreciation for dignity of the human person. It opened his eyes to a new ministry. Fr. Chris works in prison ministry. His prior pastor, Fr. Tom Conway, was director of prison ministry and he encouraged him to become involved. He was inspired by the prisoners at Walpole prison and meeting men who still treasured rosaries they received from Mother Teresa when she visited them in the prison when she was in Boston. Christ came not for the healthy but for sinners and he sees that there but for the grace of God go I. These are our brothers and sisters. Scot recalled Matthew 25, where Christ called us to visit the imprisoned as a work of mercy by which we will be judged at our last judgment. Deacon Jim said it’s amazing to see the faith of the men, to see them receive the Eucharist while in tears. He remembers men crying as they were confirmed by Cardinal Seán and could see they understood what they were undertaking. They know their faith and they take it seriously. Fr. Chris said this radio program and this station is an incredible asset to them. Deacon Jim said the prisons are broken down into 15 state prisons and 7 county jails. There are four or five open positions at the state prisons and none at the county. The prison chaplains are hired by the state or county, so their jobs are mandated by their requirements: AA programs, bible studies, sacramental needs, bringing in priests for Mass, and coordinating volunteers. Without the volunteers, there’s no way one person could touch all the people who need to be touched. The volunteers run RCIA programs, Bible studies, or just come to be present with the inmates. Many Catholic colleges have faculty who go into the prisons to teach theology courses and other degree programs. There’s a lot that inmates can do to turn their lives around. We’re all sinners, although theirs might be public. There is a great desire for the Sacrament of Reconciliation. Fr. Chris said society has to get a handle on the drug and alcohol problems that bring men and women to do awful things. When the family breaks down, that’s when society breaks down. Scot said prison ministry helps a chaplain get over the stigma of the ex-con. How do we as a Church not stigmatize someone who’s made a mistake? Deacon Jim said we have to recognize that these are human beings. They are our brothers and sisters and to understand this, we can volunteer to get to know them. Even just writing letters to inmates helps because some of them have no family. For someone who wants to get involved in a letter ministry, they can contact Deacon Jim and he will coordinate with the various chaplains. Deacon Jim has visited prisons with Cardinal Seán. The cardinal’s first ministry was prison ministry and he has a love for the inmates. Part of it is the recognition of the breakdown of family and other social issues. When he walks into the institution, a sense of calm falls. The men and women are thrilled to see him. He’ll visit inmates who are in solitary confinement to reassure them of the love that God has for them. The chaplains all report that when he comes he brings out the love of people. They see how he interacts with people with love and inspires others to do the same. He always reminds prisoners that they are part of us, part of the body of Christ. Deacon Jim said it’s amazing to see how much the inmates are moved that someone cares enough to come into the prison just to say hello and to share the love of Christ with them.